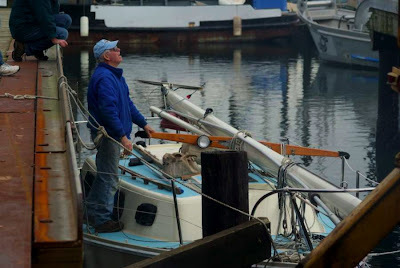 After a week away from Olympia and sweet Dervish while they fixed the crane truck, I returned last Thursday night and made a plan with Jim Benson to try to get the mast stepped Friday when the tide was right. The tides have been in the 17' range which is too high to get an adequate angle for the mast. We decided that around 1:30 pm Friday, the tide would be just right. I woke up early after my first night aboard alone. Took my pup out for his morning poo and returned to make myself a stout cup of coffee. I'm still learning how to use the Hillerange kerosene stove without undue smoking. The key seems to be to get the burner well heated prior to turning on the kerosene. If it is hot enough the kerosene becomes gaseous and burns cleanly and without smoking. If not, it burns as a liquid and smokes terribly. That morning I got it just right and managed to make my coffee without smoking myself out. I reached down under the starboard quarter berth, turned off the kerosene and sat down to savor my morning java. But something smelled... weird. Hot. Toxic. Holy crap! I spotted some black smoke wafting up from the starboard bulkhead near the stove. I lifted the cushion and sparks flew. The battery charger wires were melting. Quickly, I unplugged the charger from the AC outlet. The wires ran from the charger down under the companion way steps to the batteries. Flames were flicking up through the finger hole in the step. I opened the hatch and huge cloud of smoke puffed out. I reached for the nearby extinguisher, but decided to try blowing it out first. And by golly, I blew the flame out. I disconnected the clamps on the battery terminals which sparked and flared up a little. I threw the whole mess out into the cockpit and opened every port and hatch. My heart was pounding. I nearly lost my boat to a fire. WTF?! Steve had kluged the charger together until we could get a permanent one installed. There was a place where the wires were twisted and taped together and evidently when I lifted the cushions to get to kerosene tank, I caught the wires in it and then managed to smoosh it enough to cause a short. I inspected the batteries and all the other wiring. Nothing seemed to be damaged. I tested the battery. Phew! All was well. I drank my coffee out in the cockpit in the rain where I could at least breath. I wondered if it was a good day to try the mast stepping. Did I totally screw up by not doing the de-naming ceremony? Events like this turn me superstitious in a heartbeat. After coffee and a meditation, I talked to Jim and everything was set for 1:30 pm. The truck had started fine that morning and the weather was dry and calm. I motored over at the assigned time and met my crew: Jim Benson, Jib Harlan, and Jack the crane guy. Everything looked good. 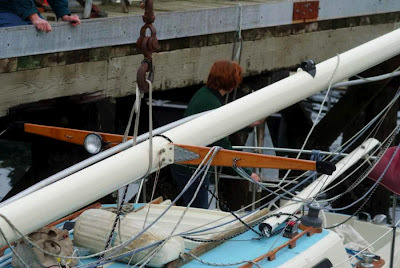 We hooked up the mast and slowly they hoisted her up while I scuttled about clearing lines and such. The only problem we had was when the bow pulpit got caught over a chunk of wood on the piling (visible in bottom center in the picture below). As the tide ran out the boat lowered several inches and got hung up on it. 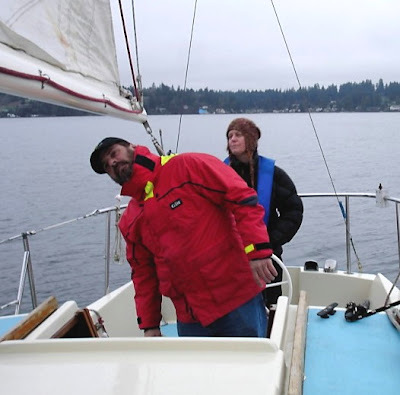 We had to stop while everybody moved to the stern to raise the bow enough to get it off the wood. 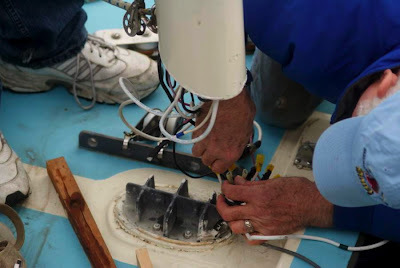 Once the mast was up and steady, Jim had to work fast. All the wiring for my boat exit the bottom of the mast (rather than through a hole in it) which meant that it had to be balanced and kept within about 8" of the deck. 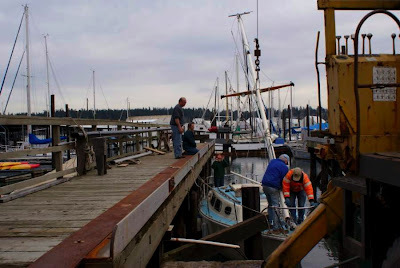 Jib steadied the mast, and Jack adjusted the crane as needed until the wiring was done. They lowered her onto the tabernacle and attached the baby stays. I motored back to my slip without incident. Then Jim worked on the rest of the standing rigging. 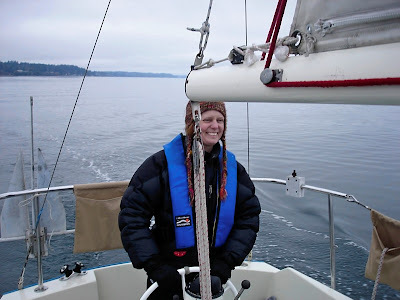 Eventually, I got Tony and Cathy to walk the docks with me until we located a Gulf 30 that had a similar furler which we could study and compare with mine. Aha! We figured it out and got all the parts in the right place! 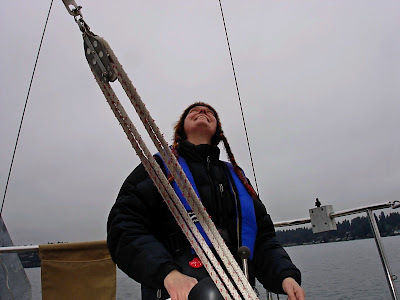 It took another full day to rig my 10 kilo bruce anchor, and run the furling lines aft along the port stanchions. I'm not so fast at all this, but I did it, and now I understand how it all works. And that is very valuable. 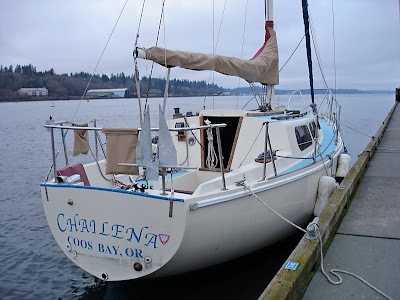 January 27th I finally got her out of the marina and into Budd Inlet. Cathy, Jib, and Zubenelgenubi crewed with me. Here I am instructing Zuben to stay out from underfoot. We motored for about 30 minutes, pushing the little single cylinder Farymann diesel engine to its limit. She smoked a little until I backed off to about 75%. I forgot to turn on instruments, so I am not sure what our speed was, but judging from the wake and apparent wind, I'd say at least 5 knots under power. Maybe even six! There was only a trace of wind, but I had to put up the sails. The main was a bit sticky going up, but the furler worked perfectly. Even in light wind little Dervish picked up some speed. 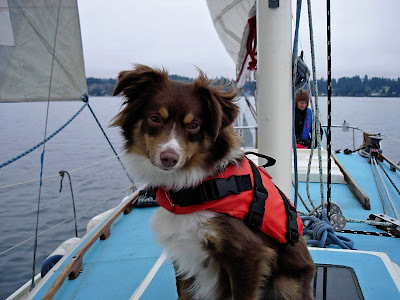 I think Jib wanted the boat to heel a bit more, but alas we just didn't get going fast enough. Zuby did his job splendidly: looked cute, stayed out of the way, and kept his vest on. 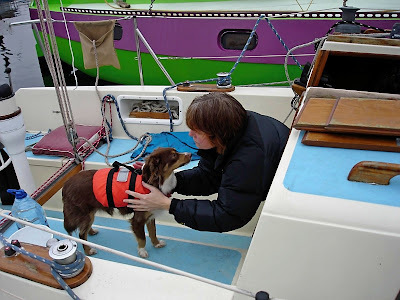 I just love the heck out of this little boat dog. In fact, Zuby is largely the reason I got this boat. But that is another story! 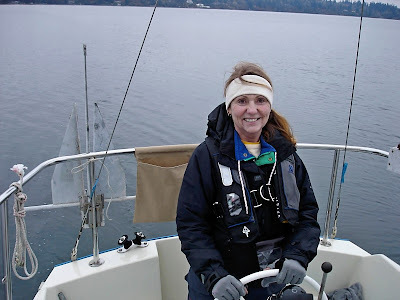 After sailing about for an hour or so, we dropped the main, furled in the headsail and motored down to the public dock at Anthony's restaurant where I practiced docking. We had a melting wire near electrical fire in our Oliver once last year. Nothing is scarier than the nearly seeing your home go up in flames. I'm glad it all worked out - I can't wait to see it in person! I find both your blog and Steve's fascinating! Your smiling face in the photos says it all. The wiring fire would have been scary! It sounds like you finally found what the final mystery part was for? If not, maybe I can help. Absolutely wonderful to know that she went to the right person! Thanks Seven C's! Well, as to the "mystery part" there were three parts that seemed to go on the furler, two of them did, but the third is still a mystery. I got an exploded of the furler and it did not include the mystery part. Maybe I'll take a picture of it and send to you. I love this little boat already.